Ireland international Andy Boyle chats about his recent move to Scottish side Ross County. 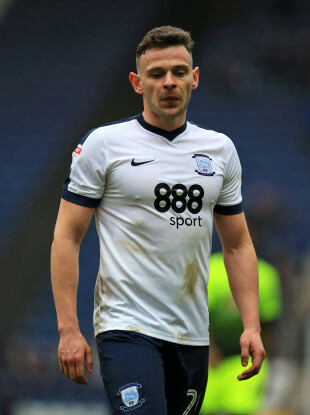 Andy Boyle joined Ross County on loan from Preston in the January transfer window. IT IS TWO years since Andy Boyle, along with Daryl Horgan, made the relatively high-profile move from Dundalk to Preston. Given the Lilywhites’ unprecedented success in Irish football, there was perhaps an even more intense focus on the pair than is usually the case for outgoing League of Ireland players trying their luck in Britain. At the time, both players were enjoying career-best form. They were part of Dundalk’s historic Europa League run, in addition to helping the club win three league titles and the 2015 FAI Cup. They had also been included in the Ireland squad for an important World Cup qualifier against Austria the previous November. Yet since then, both individuals’ careers have not gone as well as they might have hoped. Both enjoyed somewhat promising starts to their Preston careers. Horgan made 19 appearances in the 2016-17 campaign, having only moved there in January, while Boyle featured seven times in that first season. But prior to the duo’s second season, Simon Grayson, the manager who bought them, moved on to Sunderland, and both Horgan and Boyle found their game time increasingly limited under new boss Alex Neil. Horgan has since made the switch to Hibernian and while Boyle is still technically a Preston player, he has made just three appearances in the Championship since Neil’s appointment. A loan spell under Darren Ferguson at Doncaster last season began well. He made six appearances in League One, but a groin injury curtailed his progress at Keepmoat Stadium. Boyle then spent the first half of this season on loan at Dundee. He made 13 appearances for the club, but in a situation not dissimilar to his predicament at Preston, managerial upheaval had an impact. With the side bottom of the table after seven losses in their first eight games, Neil McCann was sacked as manager. The Irish defender still played nine times under new boss Jim McIntyre, but despite suggesting in early December he would like to extend his stay at the club, the struggling side allowed him to return to Preston in January. Bradford City, Oxford United and Tranmere Rovers were among the sides linked with Boyle, while Dundalk and Shamrock Rovers were also understood to have made enquiries, but in the end, the 27-year-old opted to join Championship leaders Ross County. After getting in touch with the club via his agent a couple of weeks ago, Boyle paid a visit the Staggies. He was sufficiently impressed with the facilities and had a productive chat with co-managers Steven Ferguson and Stuart Kettlewell before opting to join the club based in Dingwall amid the Scottish Highland. “After the loan spell in Dundee, I had a couple of offers in Scotland. I had offers down south [in England] and offers at home,” Boyle tells The42. “So there was a lot to weigh up. I had a look around, I had a good feel off the managers, and it’s a good opportunity to try to win the league and get promotion. With the team top of the league, Boyle acknowledged he may have to be patient to get a chance in the starting XI. However, today’s clash with Dunfermline is the first of five games in a hectic month, so Boyle is likely to get an opportunity sooner rather than later. The former UCD defender is familiar with the demands of Scottish football following his stint at Dundee, particularly after testing himself against the formidable likes of Rangers and Celtic, and while it was not perfect, that initial spell has left Boyle in a good stead for the challenges that lie ahead. “When a manager brings you in and then goes after a few games [as happened at Dundee], it’s not ideal,” he says. “The main aim for me was to go and get games [at Dundee] and that’s what I did, even when the new manager came in. “I wanted to get as many games as possible in that time frame. And they were good games to be involved in, playing at the likes of Celtic Park and Ibrox. “The more games you play, the more rhythm and consistency you get. As any player will tell you, you can train and keep yourself right off the pitch. But the main thing to find your balance is basically by going and playing games at a good level. Boyle’s hope now is to secure the sort of stability he enjoyed in three years at Dundalk. Ross County are the fourth side the Palmerstown native has lined out for in the two years since moving across the water and the centre-back concedes he is likely to have played his last game for Preston, with the player’s contract at Deepdale set to expire in the summer. “In the last few months at Preston, the new manager that came in — that’s the way football goes. There’s a change of manager and [he has] different ideas. I think everyone in football knows that’s the way it goes sometimes. “I’ll make my own career for myself. I’ll show what I can do [at Ross County] and show my ability and see where it takes me. Should Boyle succeed in that aim, he may well add to the sole Ireland cap he picked up in March 2017, coming off the bench in a friendly against Iceland. He has kept in touch with Stephen Kenny since their time together at Dundalk and there are few with a more comprehensive knowledge of what Boyle can bring to the table than the soon-to-be-Ireland senior manager. For now though, Boyle understands the futility of looking too far ahead. Email “'When a manager brings you in and then goes after a few games, it's not ideal'”. Feedback on “'When a manager brings you in and then goes after a few games, it's not ideal'”.